Paris 1871. Four Young people will rewrite their destinies. Paris is in revolt. After months of siege at the hands of the Prussians, a wind of change is blowing through the city, bringing with it murmurs of a new revolution. Alone and poverty stricken, sixteen-year old Zephyrine is quickly lured in by the ideals of the city's radical new government, and she finds herself swept away by its promises of freedom, hope, equality and rights for women. But she is about to be seduced for a second time, following a fateful encounter with a young violinist. Anatole's passion for his music is soon swiftly matched only by his passion for this fierce and magnificent girl. He comes to believe in Zephyrine's new politics, but his friends are not so sure. Opera singer Marie and photographer Jules have desires of their own, and the harsh reality of life under the Commune is not quite as enticing for them as it seems to be for Anatole and Zephyrine. And when the violent reality of revolution comes crashing down at their feet, can they face the danger together, or will they be forced to choose where their hearts really lie? Zephyrine lives within Paris during the era of a new revolution, a new government is in power and women are determined to be treated as equals, ready to stand and fight for their freedom. Living with her sickly grandmother in poverty has allowed Zephyrine to become her own woman at the tender age of sixteen. But now she finds herself unable to make ends meet, her grandmother passing and not enough to cover the cost of her burial. In Paris, there is only one way for a woman to make money and quickly, selling her body and Zephyrine is desperate. An altercation on the streets catches Anatole's attention, the young violinist on his way to rehearsals and rescues Zephyrine from the two men feuding for her services. There's something about the girl who is little more than skin and bones, skittish, untrusting and leaves with a handful of coins, riffling through Anatole's jacket and stealing what little the musician has. The city is plunging into a civil war and as Zephyrine and Anatole reunite, she is lured by his passion and free spirit and he by her instincts to fight for the rights for herself and the Parisian people. Together they will fight for a revolution against the tyrannical government trying to take hold of the capital, and against their friends who see the young lovers as nothing but a passing phase. But when war is brought to their doorstep, each will have their own part to play. Do you fight against freedom, or fight for what could possibly be the love of your life? There's something so incredibly magical about reading a historical romance, set in the midst of a civil war. I was swept up by Zephyrine's story, a girl who's family no longer wanted her and a grandmother who raised her to be a strong and independent young woman. But after her grandmother passes, the streets of Paris are unforgiving to a girl who lives below the poverty line. Zephyrine is tough and determined, not to mention opinionated. She believes in women's rights and it isn't long before she's attending meetings with other like minded women who fight for freedom from oppression, matched only by the furiosity of her best friend Rose. Anatole is a young and passionate violinist, former soldier and living with an budding American photographer in Jules. Jules is wealthy and although Anatole is only one component of an orchestra, he wants for nothing, his friend paying for their loft style apartment and comfortable lifestyle. Anatole too dreams for a Paris owned by the people, where freedom reigns and citizens are treated with respect and equality. The two young revolutionaries are drawn to one another, their shy and tentative relationship blooming to the annoyance of friends Jules and Anatole's performing partner Marie. 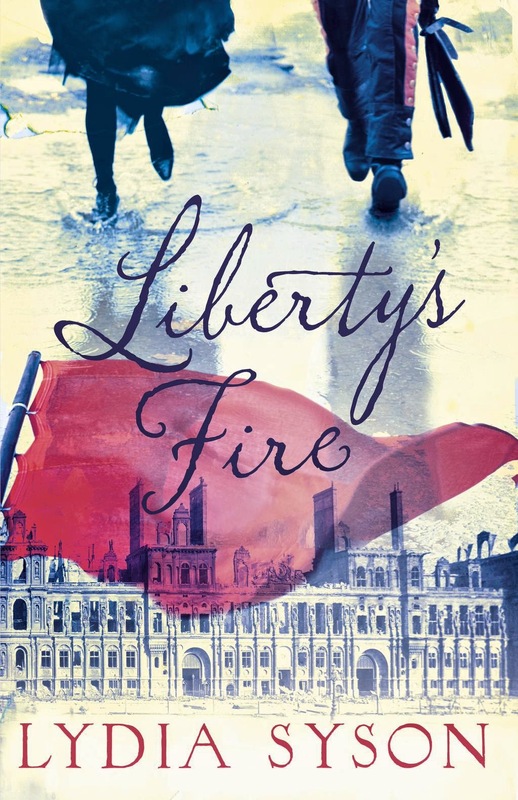 Liberty's Fire takes place on the streets of Paris during the Paris Commune, a revolutionary socialist government who took hold of the capital for a four month period and divided the country. With a political charge, it added to an already intense storyline as the two young lovers strive to protect one another while fighting for a freedom just beyond their grasp. Told in several points of view, each character is well developed with their own sense of self and each represent a section of the community during the era. The freedom fighter, the lover and protector, the foreigner who cares little of that outside his own door and the songbird who fears for the safety of her brother. The character that surprised me most was Marie. Renowned opera singer who seemingly thrived off her own sense of self importance, but took the lowly classed Zephyrine under her wing, clothing, feeding and supporting her while she grieved for her grandmother. Liberty's Fire can only be described as lovely. Beautifully written, it tells the story of two young lovers united by a sense of freedom and love for their country. The streets of Paris are painted vividly, bringing life to a city under siege from within. Methodical, passionate and hopeful, I really enjoyed it and found myself emotionally invested in their plight. The ending epilogue that takes place nine years later was stunning. I found myself holding my breath, needing a conclusion that would satisfy my aching heart. And Lydia Syson did not disappoint. This does sound lovely, atmospheric, even. You find the most interesting reads, I swear. You know I'm a huge fan of historical fictions, myself, so this book is right up my alley. I also like that this girl has some chutzpah. Definitely one book I must check out. She definitely has Joy and life hasn't been easy for her either. I love her determination and the setting even amongst the conflict is really lovely. A really beautiful sounding book, it reminds me a little of the Legend trilogy actually with the two young lovers fighting for the freedom of their country. Really wonderful review Kelly! It is Jeann, but this is more of a romance that weaves in real historical references. I'm usually not the biggest fan of historical fiction, but I really enjoyed this one. Thanks Wattle. If you love whirlwind romances set amongst a civil war, you'll love this one. It reminded me of an old black and white movie actually, just really, really lovely. Ooh, I can't wait to see what you think of it. It was a bit slow to start for me, but really ended up getting swept up in the women's rights aspect and romance. It was a little too slow to start for me. I enjoyed it, but needed just that little bit more than establishing the characters, but only a minor detail. It was really lovely though once the romance kicked it. Looking forward to seeing what you think of it Frannie. The cover is really lovely and suits the storyline perfectly. I'm not generally a fan of historical fiction, but with the oppression of the government and a revolution on their doorstep, it awoke the dystopian fan in me. The romance is really lovely too. Then I think you'll absolutely love this one Zoe. It's absolutely lovely. I was saying in another comment, that it has the making of the kind of epic romance that you see in black and white movies, but the Paris setting was so vivid and the underlying tones of women's rights and the revolution really made me invest in the plight of the two young lovers. Me too Claudia. It's really the difference between being immersed within the storyline and feeling as though you're being educated. Zephyrine is incredible. She lives in poverty, but wants to fight for what she believes in, including the rights of women and the people of Paris in the process. It was so lovely and wonderfully written too. Are they old fashioned names even? Or not French at all? This really is one for lovers of romance. Although the revolution is a big part of the storyline, I'm not sure there wold be enough to keep the lovely boyfriend interested. Although, maybe buy him a copy anyway and highlight the romantic parts. Most men could use a little help. I've been telling myself to read more historical romance, and this sounds like just the book for the job! Also, you basically sold me at "their shy and tentative relationship," because you know how much I love those. ;) I'm so glad the writing is really vivid as well, and that all the characters have their own personalities. Awesome review, Kelly! Thanks Aimee. I don't read nearly enough either, I've tried but there has only been a small few that have been able to keep my attention, and this is one of them. I love the romance. It was one of those, us against the world type romances that you can't help but be swept up in. I haven't ever read a whole lot of historical fiction, it's been a genre I've quite enjoyed when I have read it, but never had it been utterly standout, so I'm not sure whether this is for me, interesting as it absolutely sounds! I do have Code Name Verity to read, and that's HF, so maybe that'll win me over and make me rethink this one! I've read a few, Code Name Verity is on my list as well. By far my favourite has been Prisoner of Night and Fog. I absolutely adored the Paris setting in this one though, especially the artistic flare. It was really lovely and definitely worth giving it a go. It really is Paula. The world building, the characters and the romance were all just so incredibly lovely. I'd love to see what you think of it. I'm lucky enough to have the publishers recommend them to me, and with books like Liberty's Fire, I'm so glad they do. Me too Tika, even during the French Revolution, Paris is painted so vividly and I loved the romance. It verged on one of those epic whirlwind ones usually restricted to black and white movies. Thanks Michelle. I loved it too and are going to check out her other releases as well. If they're anything like Liberty's Fire, there's no doubt I'll enjoy them as well.